A bright, beautiful day - quite a change from this past week of rain, cold and wind! Blue skies, bright sun and signs of new life everywhere! Shadows abounded in the gardens as I checked for new plants. And wouldn't you know- dandelions are already out! Our robin continues to nest - she does not appreciate it when I come out onto the porch. She will leave her nest and scold me from the fence! Be sure to check out the great shadow chasers at Hey Harriet - that super fun meme created by Tracy! The past few weeks I have been focused on losing weight and paying closer attention to what I eat and to becoming more active. I actually came second in our "Biggest Loser" competition at school and won $200 for losing 8.9 % of my weight by Easter. But over the past few days, I lost my focus and have gained back a few pounds! I don't feel as well either! With the competition at school restarting next week, I want to refocus my attention on healthy goals and get back on track. I want to refocus on my goal of daily activity like dancing and eating properly. As Jamie says: "You can be a maker of magic and a tender of wishes. It’s easy. Answer the wish prompt above on your blog . Support wishes by visiting other participants. It’s that simple. There is great power in wishing together." Be sure to visit the other wishcasters here. Here's hoping everyone had a wonderful Easter! Time is up - time to announce the winners of my 500th+ post (and 2nd blogversary!). I'd like to thank all of the people who did leave a comment - it was much appreciated! Ewian, Leone and Ginny will receive an ATC. I will be in touch with all of you to get your addresses. Shadows abound everywhere! This week my class took a tour of the Woodland Cultural Centre in Brantford and I was able to photograph not only displays, but some shadows as well! Sorry- we could not use flash and the trophy was not as clear as the shadow! Loved the shadow though! Be sure to check out all the best shadows at Hey Harriet!, the super fun meme hostess by Tracey! Skies are for watching - in all their glory. The change from day to day - even from hour to hour can be amazing. 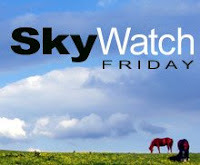 Sky Watch Friday allows us to share these skies with others around the world. I've been seeing a lot of these clouds lately! When will spring finally come to stay?! It was a full moon on Sunday - such a glorious site! Be sure to stop by for more glorious skies at Sky Watch Friday. Time once again to share those spots of shadows for Shadow Shot Sunday, that fun meme hosted by Tracy at Hey Harriet! No matter where I go I always seek out shadows! This week driving to Hamilton, I caught a few shadows along the way. I love the shadows that trees make especially! Be sure to visit the great shadow-chasers here. Skies - I am always amazed at the beauty of the different faces of the sky. From morning to late afternoon the skies were so changeable. This poem speaks to that beauty and changing nature of the sky. Be sure to visit the wonderful skies of the skywatchers here. Just a reminder that I am having a giveaway - for my 500th post and 2nd year anniversary! Visit here to leave a comment. Thanks! I have been a reader all my life. It is pure pleasure for me to curl up on the couch and get lost in a book. Books have always been my friends. Teaching full time has cut my book reading time. I spend more time reading magazines throughout the school year and save books for holidays. Sometimes though a great book just calls out to be read, even though I know I shouldn't. This past month I finally read "Good in Bed" by Jennifer Wiel ( a great book) and The Thirteenth Tale by Diane Setterfield (loved it!). My weakness is books and I have trouble going to Costgo and not coming out with at least one book. Last week I walked out with 3! I always have books waiting to be read. Friends recommend books and a gal at work trades books with me. Right now I have 2 books on the go - "Half Broke Horses" by Jeannette Walls and "The Hours" by Michael Cunningham. The next 2 to be read will most likely be: Heart of the Matter" by Emily Giffin and "The Help" by Kathryn Stockett. I keep a notebook that lists books that have had great reviews, been recommended by someone or is a new book by a favourite author. I also keep track of great art books that I want to get. I just read a recent post by Lis of "Dandelion Seeds and Dreams" about her love of books and why she wouldn't want a kindle. I can so relate to what she wrote. I write in my books and share them and treasure them I can't imagine reading from a cold kindle! I wish I had more time to read though - without the guilt! I also wish I could read all the books I have waiting to be read! Please take part in my giveaway - you have until Easter Sunday to comment here! It has been awhile since I posted a Sunday Wrap-up. Sundays seem to have gotten busier lately, usually trying to complete schoolwork Sunday evenings. But I have had a creative week -finally! I took part in I-Hanna's Postcard Swap and mailed the 10 postcards off this week. I had fun creating them, playing around with paper, paint, stamping and collage. The backgrounds were mostly subdued colours to represent the dullness of late winter, with just a touch of pink to represent the promise of spring to come. Then yellow and green were rolled on to represent the coming of spring. I finally finished the April calendar for "The Kathryn's Wheel" calendar challenge. March was partly filled in. I hope to do better this month! Spring has finally sprung! Warmer weather, robins and crocuses were all signs this week! Our robin has returned to nest on the big ladder on our back porch. Here is a first look at the nest - a day's worth of work! It wasn't there yesterday when we left at noon. Today it was! This marks my 500th + post! I have also passed my second year blogversary! Hard to believe. As I looked back on my very first post in March 2011, I realized that I have achieved what I set out to do and as well, have added so much in the way of creativity, community and challenge to my life. I look forward to so much more in the year to come. I have "met" so many wonderful bloggers and admired their work from afar. I have taken courses, responded to challenges and created my own challenges. I may not have completed all of them, but they were so enjoyable. Art has become more central to my life and I want to keep learning and doing. To thank those who visit and who I visit, for their support and kindness, I am hosting a giveaway! Leave a comment below for your chance to win! I will draw winning names on the evening of Easter Sunday! Be sure to leave a way to get in touch! I will be giving away 2 postcards similar to the above, as well as 3 ATCs. If more than 50 leave a comment, I will add more cards to the giveaway! A glorious morning - blue skies and a bright sun and it is warming up - finally! I set out looking for signs of spring and I found lots of tiny islands of colour. Many of the flowers were shrouded in shade - perfect for SSS! Be sure to visit the great shadow-chasers at Hey Harriet, Home of Shadow Shot Sunday! As I read Jamie's prompt today, I knew I had to respond! What do you wish to transform? Several weeks ago I entered a contest to win a $25,000 kitchen makeover. Yesterday the first round of 100 finalists was announced and I did not make the cut. I could not believe how disappointed I was! Cinderella Transformation Needed Description: When I was growing up, the kitchen was the heart of our home. Cooking meals and baking wonderful-smelling treats, long chats over delicious meals - these always kept our family together with so much laughter and sharing.Today, I would love to have that intimacy. But our space now is too small, cluttered and very outdated. I want light, space, plenty of room to move around: a place for baking where I can actually roll out pastries and cookie dough; a place where my husband and I can comfortably work together to create a meal; a place where visitors feel welcome and can pitch in; and a place finally, for all my many cookbooks and my husbands steins, both of which are homeless.I would so love for my cramped, "cottagey"-styled kitchen to have a Cinderella transformation.On my wish list would be new, updated cabinets and appliances, a new wall of cupboards and cabinets with a baking centre, all sporting a fresh, new outlook! In less than 250 words I put my dream on paper. With Jamie's question, I know that I have to take that dream and actually do it! So, I want and need to transform my kitchen, and as well my living space. No more talking and dreaming - action is required! Visit Jamie Ridler Studios and the other wishercasters! This morning the sun was bright, the sky was blue and the shadows were great. Here's a shadow of the huge pine in our front yard. I actually went out to get shots of the robins hopping around our yard. For me, they are the true signs of spring. There may not be shadows but I love these birds. Had to include this photo of the snow shadows that look like mountains on our front walkway. At least that has melted now! Be sure to visit other shadow chasers at Hey Harriet.